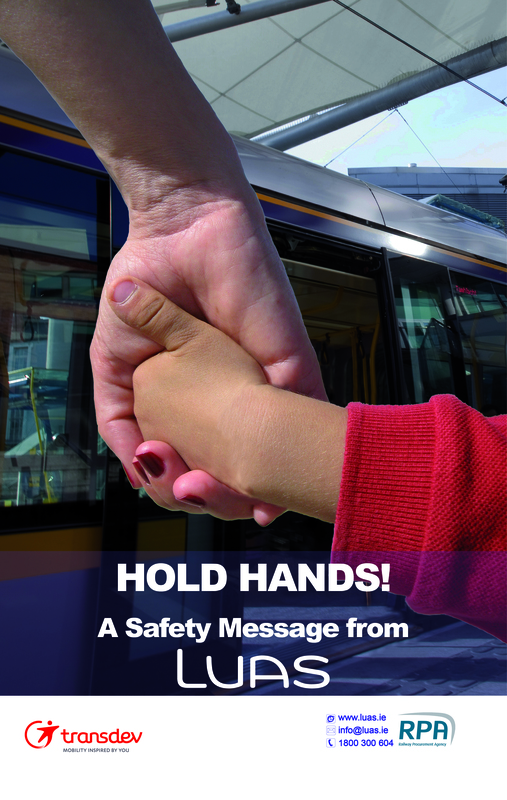 Stay Safe with Luas: Luas is a welcome part of Dublin's development. Let's make sure we all stay safe. Emergency Help Point located beside Ticket Machine. Press and speak directly to Luas control room. Emergency Button beside door. Press and talk directly to tram driver. Emergency Handle beside door. Pulling this handle will bring the tram to a Stop. CCTV downloads can be requested from Luas Customer Care LoCall 1850 300 604 and info@luas.ie. Please note a request must be made immediately particularly if it relates to an incident. The type of information which is required is location, time, Luas line and date. The issuing of CCTV follows guidelines as laid down under data protection legislation and in accordance with good practice. * Luas Security and Revenue Protection Staff are not on board every tram. You must have a valid ticket to board the tram. Do not board or exit the tram when the doors are closing. Be aware every tram has an emergency button/handle at the door. Emergency Help Points are on all platforms beside the Ticket Vending Machines. Hold onto handrails when on the tram. Please show respect to other passengers. All trams and Stops have CCTV. Wheelchair passengers and those with buggies please use double doors in the middle of the tram. Never amber gamble. Never break a red traffic light. Never stop on a yellow box on the road. Be aware of motorbikes and cyclists. Do not obstruct the tramway. Look both ways when turning. Use designated crossings to cross. Listen for horn and warning bell - headphones and mobile phones may distract you. Look both ways before crossing a track. Keep clear of overhead power lines. Make sure you are not hidden by a parked car when crossing. Tram tracks are slippery in wet and icy weather. Be alert. Do not cycle in tram lanes. If you have to cross the tracks, do so as close to a right angle as possible to avoid the bicycle wheel getting caught in the Luas tracks. Always use a cycle lane where provided. Please adhere to all road and tram traffic signalling and road signs. Please take time to stop, LOOK LEFT AND RIGHT, and listen for horns and warning bells from approaching trams before crossing. Prepare to cross well in advance and take your time. If necessary for your safety, dismount and cross the rails on foot. Be alert in wet and icy weather, the ground and tracks can be slippery. If you're travelling with a buggy: always board Luas at the same time that you are boarding your buggy. Family seating areas on trams: There are family seating areas on-board. Please kindly ask passengers to leave them for you and your family in order to stay together. What to do if you lose your child? Please immediately contact Luas Control Room by pressing the Emergency button at Stop (located beside the Ticket Vending Machines). Explain to Luas Control Room at which Stop you are and in which direction the tram your child is in is travelling. Luas Staff will ensure that you and your child are re-united as soon as possible and will keep you informed of all the steps to follow. Please immediately contact the Luas Driver by pressing the Emergency Button on-board. Explain to the Luas Driver that you are on-board and at which Stop your child IS AT.